For this post, I’m just going to look at Esmeralda’s costumes from the 1956 version of the Hunchback of Notre Dame . 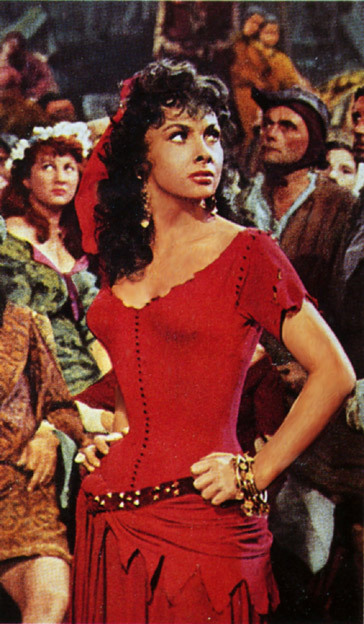 Esmeralda’s red costume is the most remembered costume from this movie. Now this was the first colorized movie version so prior to this, Esmeralda’s costume didn’t have “official” colors. Now I have said before that I hate Esmeralda in red and this movie could have started that trend in movies. However I’m not going to let my dislike of a color choice get in the way of this review. This costume is much different from the previous Esmeralda costumes. Instead of a chemise with a corset over it and long skirt , we have a corset under the blouse and long skirt. Now one can argue that since Romani women were not much of a subject of medieval paintings it’s hard to know what exactly what they wore. However I highly doubt any Romani women would have wore what Esmeralda is depicted as wearing in this film. This costume really reads as a 1950’s rendering of a Gypsy. Is that a bad thing? No, not really. How a common fashion styles impacts costumes in movies keeps things interesting, at least for me. However the cinch waist and defined bust line was a big hallmark of 50’s fashion. So let me say what is wrong with costume from a more or less history/story context and then I will state what I think the positives are. First off, the corset. The corset didn’t become and undergarment till the 16th century, and the definition wouldn’t have been so defined as this. I personally find the waist line on this costume to be too much. Second I find the monochromatic color a little odd. 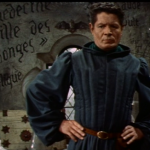 The only other character in this movie too wear one color is Frollo (and in one scene Jehan). It just seems out of place and character to make her wear a single color. I get what they were trying to do in putting her in one color, it was to make her stand out from all the extras, but if just makes it look like she is from a different movie. I think that is main compliant I have with this costume, it has no synergy with it and the other costumes making it look out of place. There also the little matter of her dagger being used as as accessory. In the Book Esmeralda concealed her little dagger as it was against the law to carry one. Here it’s on full display which makes it seem more like a part of her costume rather than a plot point or a weapon. And then there are the darts. A dart is a sewing technique where fabric is folded and sewn to give it a three dimensional shape. The dart was pioneered in the early 1950’s. Esmeralda’s costume has a total of two sets of darts. One sets on the bust and the other runs vertical on the front. It’s a utilitarian anachronism but it makes the costume look way more modern than the other costumes in the movie. Esmeralda second costume is a little bit more refined. She wears a yellow costume that has the same basic components as her red one but with a gold trim along the bust. This costume has different tones of gold which break it up nicely. Again it looks a bit modern for the style of the movie. Then there is her third costume which is nothing more than a white shift. Which is exactly what it should be. It probably her least interesting costume but it fits in the most with movie and the book. Also when she wears the shawl with it, I think it’s a nice touch. All in all her costumes defiantly have a sense a style and the departure from the normal Gypsy look is refreshing. Do I personally love these costumes? No but I don’t hate them despite my nitpicking. I just wish that red costume as it is the iconic costume blended better in the film better.